Lithium-Ion batteries lose capacity as they age. It’s just a fact of live. The more you charge and drain them, the more capacity you lose. After a year or so, the difference in capacity is fairly significant, and it only gets worse as more time passes. Want to do something about it without having to give up your phone and pay to have the battery swapped? Check out the XDesign iPhone 8/7/6s/6 Battery Case, which works with all four models and costs just $14.99 on Amazon. 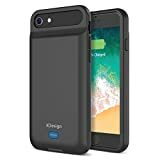 [Compatible with iPhone 8/7/6s/6] MADE FOR iPHONE – This powerful 3000mAh built-in lithium polymer battery can effectively provide more than 100% additional battery life to your iPhone. Also, it’s designed with a female lightning port to be compatible with all your lightning cables. Never worry about carrying extra micro USB cables! DURABLE DESIGN – Made out of a soft, flexible, silicone casing, making it incredibly easy to install onto your iPhone and providing additional protection against daily wear and tear, scratches and scrapes. ONE-YEAR WARRANTY – XDesign provides a one year warranty to protect against defects of your battery case.